How did your firm perform last year? Did you do better than the prior year? I’m sure the majority, if not all AEC firms, evaluate their performance in comparison to prior years, but do they evaluate how they performed against similar firms within their industry? Fortunately, the Deltek AE Clarity Report provides unique insights into the AEC industry that make an accurate comparison possible. Firms that work on water, wastewater, and storm water projects, expect their work in the market to grow by 59%, the highest percentage of all surveyed markets. Additionally, markets in which more than half of respondents work in expect their business to grow. These include commercial sector respondents who expect a 58% increase, roads and bridges markets with an increase of 57%, and surveying and GIS sector with an increase of 55%. Markets in which respondents are least optimistic for growth are public facilities with an increase of 38.4%, the hospitality sector with an increase of 38.5%, and a 45.4% increase in the residential sector. Nonetheless, these are still encouraging numbers! AE firm leaders reported that the top three factors influencing the success of their companies are the right people, which was cited by 75.7% of respondents, long-term relationships with clients was by cited by 74.7%, and 65.5% of respondents said their firm reputation influenced their firm’s growth. How does client retention affect your profits? Learn the formula to calculate this here! There’s even more positive news in last year’s AE Clarity Report. Of the AE firms that participated in the survey, they responded that they had a proposal win rate of nearly 50%. Further positive news is that 42.9% of respondents reported that their win rate has increased either slightly or significantly in the past two years. On the other hand, 12.3% reported that they experienced a drop in their win rate during the same period. The top choices for business development responsibility were the executive team that drove 84.7% of their efforts and project managers who drove 68.6% of the business development efforts. One might suspect this comes from developing meaningful relationships with existing clients. Overall, about 60% of AE firms said they employ a go/no-go process in at least some situations. Of these, 29.2% said the employ process for all opportunities, and 30.6% for specific cases, especially “strategic” opportunities. Top ranked project management challenges included accurate project cost forecasting, and difficulties with collaboration and communication. On the other hand, one statistic showed that 75% of projects were currently on or under budget for the majority or survey respondents. So how did your firm stack up against these results from the 36th Deltek AE Clarity Report? 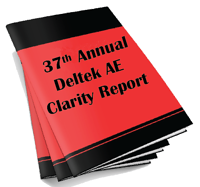 What’s New in the 37th Annual Deltek AE Clarity Report? Great question! But just as important, what do you do with this information? Learn what Deltek experts think and how they use this information at an upcoming AE Clarity Tour stop near you. The 37th Annual AE Clarity Report will be out soon!